Jeans have now turned into a necessity rather than fashion. Everyone wants at least one pair of jeans in their wardrobe. Be it old, young, children or grown-ups, everyone loves to wear jeans. Jeans is included in one of the most comfortable outfits which can be put on anytime and anywhere. You can wear jeans to parties, outings, travelling, picnics, even in formal occasions and other functions. Jeans have not only taken its place in being the best outfit but it has also made its exclusive place in the era of clothing and it has the potential to last long, for sure. In spite of such popularity, many people get confused when it comes to wash their jeans. They are unable to find a proper way of washing their jeans and they are also scared about the fact that if they go wrong then their jeans might get spoiled. So here are some remedies that will help you wash your jeans properly and without having any trouble of color fading or spoiling of the material. Set your washing machine in a gentle mode. High mode can spoil the material and can make your jeans rough and hard. So always make the fact sure, that your machine is set in the gentle mode so that this doesn’t affect the material (if the material is too delicate then there are chances that your jeans might tear). Use soft detergents or the detergents with mild ingredients. Harsh detergents might put negative effect on the fabric. It may result in spoiling the fabric and your jeans won’t take much time to get spoiled if once the fabric is affected. You can use a delicate fabric softener in order to reduce the harshness that your jeans face after getting washed by detergents. Never do the mistakes of washing your jeans in hot water, always prefer cold water. 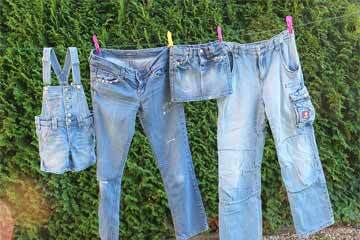 Hot water may result in the fading of color of your jeans and added to it hot water may also shrink the fabric. Follow the washing tips that are there on the label of your jeans. This can be a great help for you while you wash your jeans. Turn your jeans inside out while washing. Do not put your jeans with other clothes that are of different color as there might be over lapping of colors. If your jeans is blue in color then make it sure that the other clothes that you put inside the wash machine are of same color. Or the best thing is wash your jeans after washing all your other clothes. Do not wash your jeans regularly. Many people wash their jeans after using it 2 to 3 times. This should be avoided strictly. Always keep it mind that the more the jeans comes in contact with water, the more is the risk of the fabric getting spoiled. So if you don’t want to wash your jeans once a year then wash it once a month but don’t wash it every second day. If you are washing your jeans with hands then make your hands go gentle on the fabric. Don’t rub it harshly. If you think that your jeans is not ready for a full fledged wash then you can just dab it with a wet cloth and wear it.